Today we’re wrapping up Apple’s main WWDC 2018 keynote in as simple a fashion as possible. With what this article explains, I’ll touch on the main topics and will offer an expanded look at each topic as it pops up, if you do so wish. For the average user, the announcements Apple made this morning can be summed up in a succinct set of paragraphs. You’re almost certainly going to download iOS 12 when the time comes, so it’s not particularly important to speak about reasons why you might want to tap that button. BUT, if you wondered, there’s a new Privacy war going on now, and it starts in iOS 12. There’s also an AI upgrade for Siri for better suggestions for answers, Photos sharing upgrades, and camera sync – some of this is linked below. But you came for the update itself, not the details! Every iPad and iPhone currently capable of running iOS 11 will get access to iOS 12. The release of this platform begins today – sort of – if you’re all about that preview mode. Have a peek at the iPhones and iPads that will get updatedto see if you have a device in the mix. Chances are you do, or might. 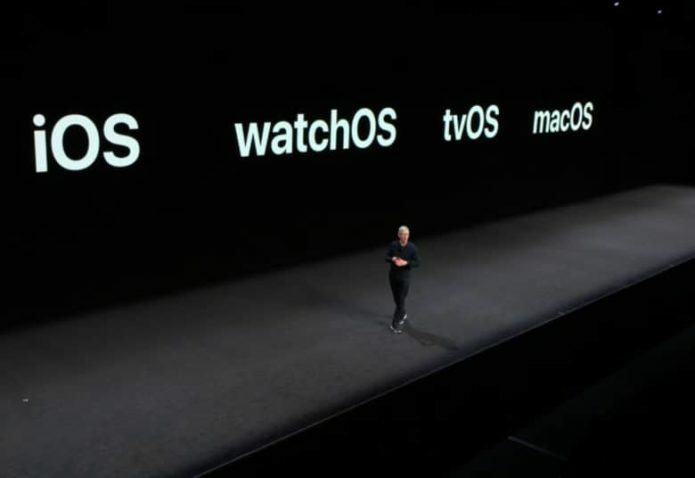 The same is true of the new macOS Mojave, coming this fall for all users. Have a peek at our 5 quick new features in macOS Mojave to get a better understanding of what’s coming up. To make it even quicker: Dark Mode, automatic desktop organization, instant photo info in Gallery View, instant desktop sync with iPhone camera*, and better screenshots – that’s what’s coming to the next desktop update. You might also want to see the new Mac App store or how *Continuity Cameraworks. The Apple Watch will finally get its Walkie-Talkie feature after it was first announced 4 years ago. Yes, really. The Apple Watch will also get a Podcasts app in watchOS 5, as well as a bunch of fitness and health features. You might also want to pick up the new Pride Apple Watch Band and watch face right this minute. A few other bits and pieces stand on their own, and aren’t necessarily the most need-to-know sorts of news for everybody. There’s a new sort of Animoji for iPhone X called Memoji. It’s probably one of the 5 broken seals of the Apocalypse, so keep an eye on it maybe. If you want to speak on FaceTime in a group of 32 people, that’s quite possible now. For you, and most people, soon. The Apple TV 4K will soon roll with Dolby Atmos support. If you’ve got big fat speakers and such, that might shatter your ears into a bunch of little pieces. If you’ve got a vehicle with CarPlay inside, you’ll soon be able to use Google Maps and other 3rd-party apps – at last! Oh wow, oh Waze too! Perhaps the most important tool for people looking to cut themselves back on the iPhone addiction is the Do Not Disturb update. AKA what I’d call the Mindfulness Collection. And if you’d like to use your iPhone MORE than you do now, there’s always the amazing ARKit 2 update complete with LEGO!